Divine Word Missionaries is the world’s largest Catholic missionary order. We serve in locations around the world spreading the Divine Word and offering hope to the most disadvantaged. We focus our missionary efforts in four primary areas: Education, Poverty, Peace and Justice, and the Global Church. Mission Impact serves as a conduit between those in need in the most remote corners of the world and those whose hearts are moved to support a change. Mission Impact is Divine Word Missionaries. Through Mission Impact we support and pray for our missionaries and those they serve. We spread the Good News of the Gospel and promote our missionary work around the world. We invite you to become part of the Divine Word in action—to make an impact with us! Become a part of our community and connect with us today! 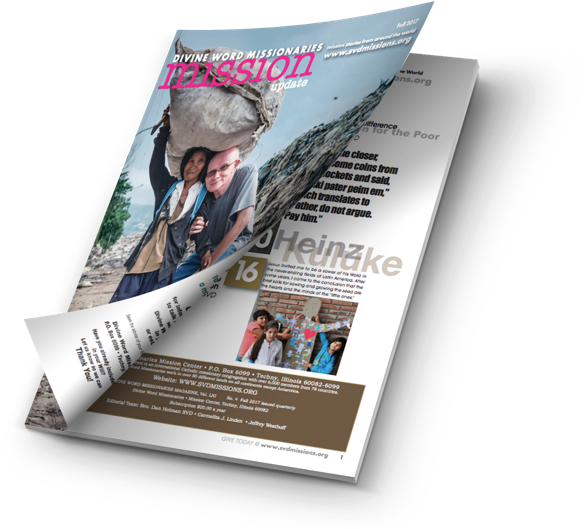 Stay up-to-date on news from the ministries of Mission Impact with our monthly email newsletter. Divine Word Missionaries fulfill needs and act in countries all over the world. Follow us and share our stories on social media to help us spread the Word.